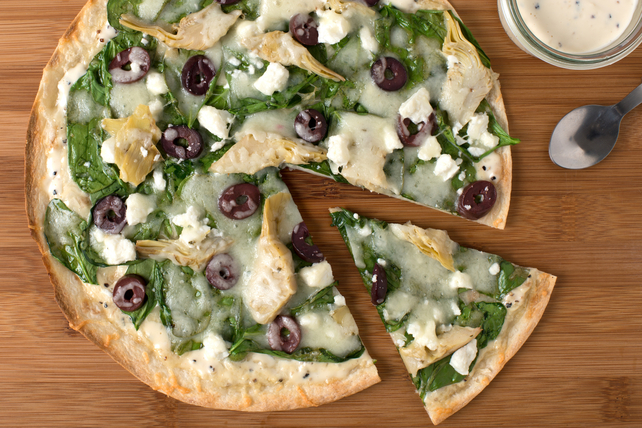 Tortillas are used as the base for these quick pizzas flavoured with tasty toppings, such as Caesar dressing, spinach, artichokes, black olives and feta cheese. Place tortillas in single layer on parchment-covered baking sheet; spread with dressing. Sprinkle evenly with 1/2 cup shredded cheese. Top with spinach, olives, artichokes, feta and remaining shredded cheese. Bake 10 to 12 min. or until edges of tortillas are crisp and golden brown, and cheeses are melted. Top evenly with 1/4 cup chopped seeded tomatoes before serving. GLOW magazine "Favourite Way to Renée," submitted by Val Reynolds, Edmonton.